The trial of Japanese war criminals Lieutenant General Ishida, Colonel Nakamura, Colonel Ishii, Lieutenant-Colonal Yanagita, and Major Chida, for crimes committed against POWs during the construction of the Burma-Siam Railway. 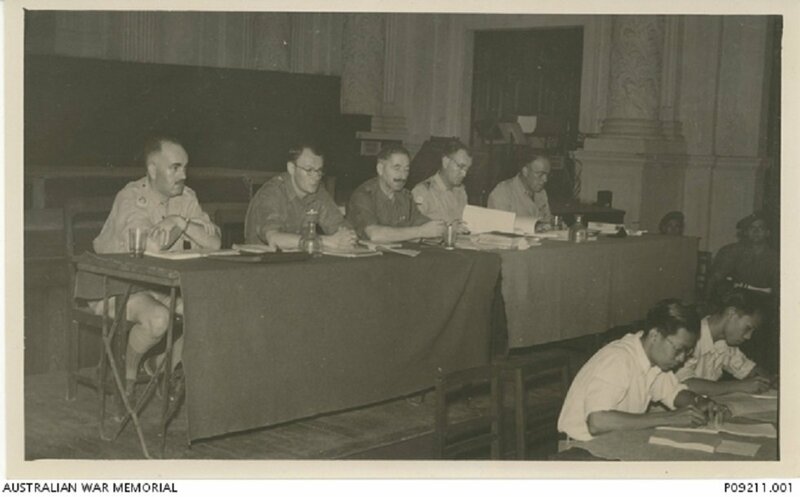 The court members seated at the left are probably, from left to right, Major J.C. McGrath, Major A.A. Dumont, Lieutenant-Colonel P.A. Forsythe, Lieutenant-Colonel C. Honod de Froideville, and Major N.F. Quinton. Image taken October 1946 by Straits Times, provided courtesy of Australian War Memorial. All the defendants were senior officers in charge of British, Dutch and Australian POWs working on the Burma-Siam Railway (known commonly as the Death Railway). The 1st defendant, Lieutenant General Ishida Eiguma, was the overall commander of the Southern General Army Railway Unit, tasked with building the Death Railway. The 2nd defendant, Colonel Nakamura Shigeo, was the Commander of the Siam Prisoner-of-War Administration. 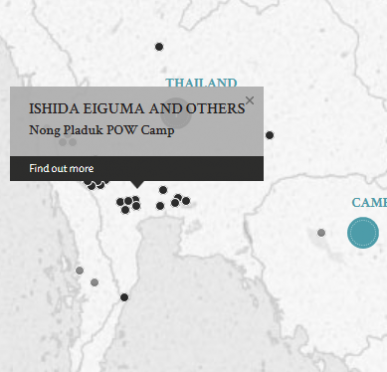 The 3rd, 4th and 5th defendants, Colonel Ishii Tamie, Lieutenant-Colonel Yanagita Shoichi and Major Chida Sotomatsu, were camp commanders of various prisoner-of-war camps under the Siam Prisoner-of-War Administration. All the defendants were charged with providing insufficient accommodation, food, clothing, medication and poor hygiene conditions while overworking the prisoners-of-war and giving them frequent beatings which resulted in the deaths of many. All 5 defendants were found guilty of these common charges against them. Certain defedants were charged with individual offences. The Colonel Ishii Tamie was found guilty of ordering the death of a British prisoner-of-war who was in a fight with a camp guard. This prisoner was subsequently abused and shot. Colonel Ishii Tamie and Major Chida Sotomatsu were charged with exposing prisoners-of-war to aerial attack while working on the Railway and were found guilty. Lieutenant-Colonel Yanagita Shoichi was charged with ordering the death of 4 British prisoners-of-war who attempted to escape and was found guilty. Unlike many other trials, there were 5 judges on the court-martial instead of 3, which was the norm. The court made a recomendation to mercy in the case of the 2nd defendant as he had court-martialled a Japanese officer who had shot a prisoner-of-war. However upon review, the Office of the Judge Advocate General noted that if the court itself had decided on the death penalty and in the absence of any evidence to an exemplary character, there were no grounds to reduce the sentence and the death sentence for the 2nd defendant was upheld. During the witnesses testimony, a Lieutenant-Colonel Toosey is metioned as requesting the 5th defendant for additional anti-aircraft protection for the prisoners-of-war working along the railway. This is likely the same senior British officer who was the inspiration behind Sir Alec Guiness's character in the 1957 film, The Bridge On The River Kwai. Ishida, Eiguma. Lieutenant General. From Japanese military. From Japan. Guilty. 10 years' imprisonment. Sentence confirmed. Nakamura, Shigeo. Colonel. From Japanese military. From Japan. Guilty. Death by hanging. Sentence confirmed. Ishii, Tamie. Colonel. From Japanese military. From Japan. Guilty. Death by hanging. Sentence confirmed. Yanagita, Shoichi. Lieutenant-Colonel. From Japanese military. From Japan. Guilty. Death by hanging. Sentence confirmed. Chida, Sotomatsu. Major. From Japanese military. From Japan. Guilty. 10 years' imprisonment. Sentence confirmed. Honod de Froideville, C. Lieutenant-Colonel. From Dutch military. Quinton, N.F. Major. From Australian military. Dumont, A.A. Major. From British military. Solicitor. Couch, E.L.St.J. Lieutenant Colonel. From British military. Solicitor. Hibbert, A.A. Major. From British military. Solicitor. McIntyre, Grant. Major. From Australian military. Barrister. Bains, N.S. Major. LL.B., Advocate Lahore High Court.